In terms of tennis, age is rather relative. It is a sport that can be picked up by anyone, at any age, so long as you are feeling fit and have a positive attitude to learn. That being said, there are pros and cons to starting tennis at different ages. There is no right or wrong age, of course, but some people may find the necessary skills easier to pick up at a younger age. Generally speaking, the younger you are, the easier it is to learn a new sport. This is because the muscles are more limbre, the energy levels higher, and the body more agile. It is easier for the brain to process new skills at a younger age and the more fluently the movements of tennis can commit themselves to muscle memory. Kids tennis lessons in Singapore are everywhere! Nonetheless, tennis is a sport for anyone of any age. Some people choose to pick up tennis later in life and find the rhythm easier enough to get into. However, the question age does generally revolve around children and what is the best time for kids to get into the sport. For professional players who have competitive goals of seeking the Wimbledon title, the starting age can be as young as 2 or 3! For the average child, this is a bit too young. Although it is a good age to pick up a racket and hit a large ball around, it shouldn’t be taken too seriously at this age. Between the ages of 3 to 5, children do start developing hand-eye coordination. This is a good time to expose them to the idea of tennis, familiarise them with a racket and ball, and have some fun with sports. Tennis lessons aren’t overly useful at this time, unless they are part of a wider sports development lesson focusing on gross motor skill movements. 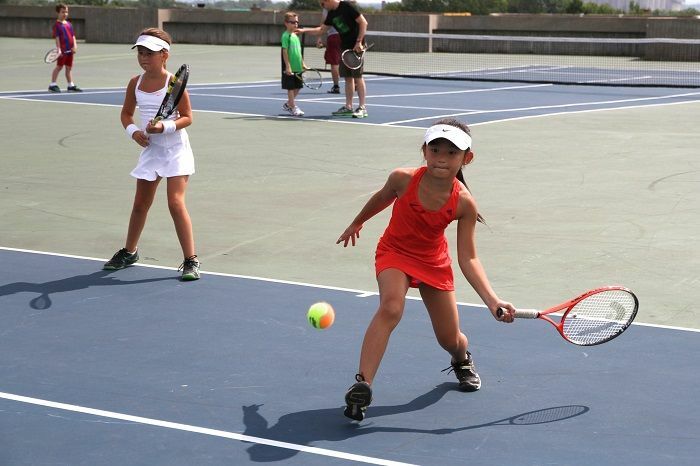 Around age 6 to 8, children are more ready to start proper tennis lesson. At this age, the muscles, ligaments, and tendons are ready to pushed further. It is easy for these areas of the body to strengthen under duress. Also, kids have a much longer attention span by this age, so they can better pay attention to the rules and techniques of tennis. Whatever age your child decides to take tennis seriously, the most important thing is keeping their attention and enthusiasm. You can have the most promising 8 year old running around on the court, but if they get bored of tennis and lose interest, perhaps it wasn’t the best age to get them started. With sports and tennis lessons, often listening to the child and their interests is the best way to determine what age is right, all the while giving them active encourage and positive reinforcement throughout their decision making.